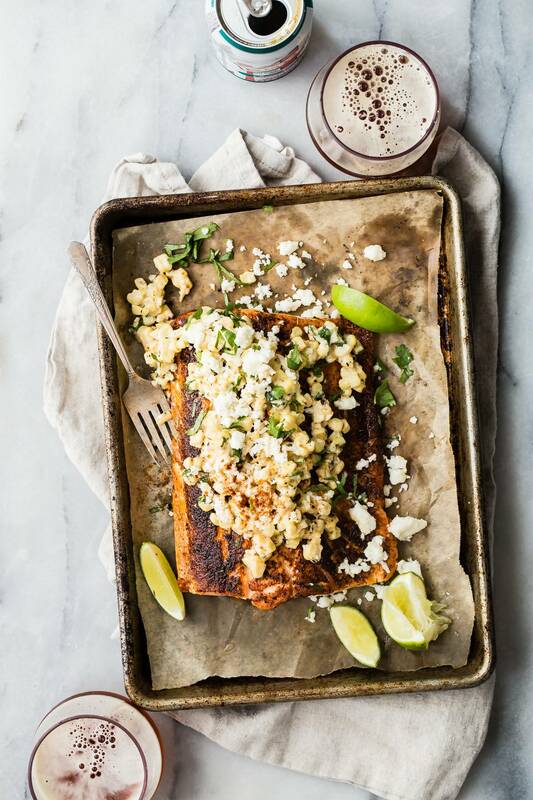 Juicy blackened salmon topped with a Mexican style street corn relish. Oh salmon, you get me every time! Healthy, easy to cook and great for feeding a family or a bunch of friends. I always feel much less pressure cooking salmon than steak where the line between perfect and overcooked is so narrow. Salmon has some forgiveness thankfully, I actually prefer the center to be more of a deep pink color so a regular size individual filet should only take about 10 minutes depending on the thickness. The corn is another easy accompaniment to the whole dish and really takes it up another few levels. 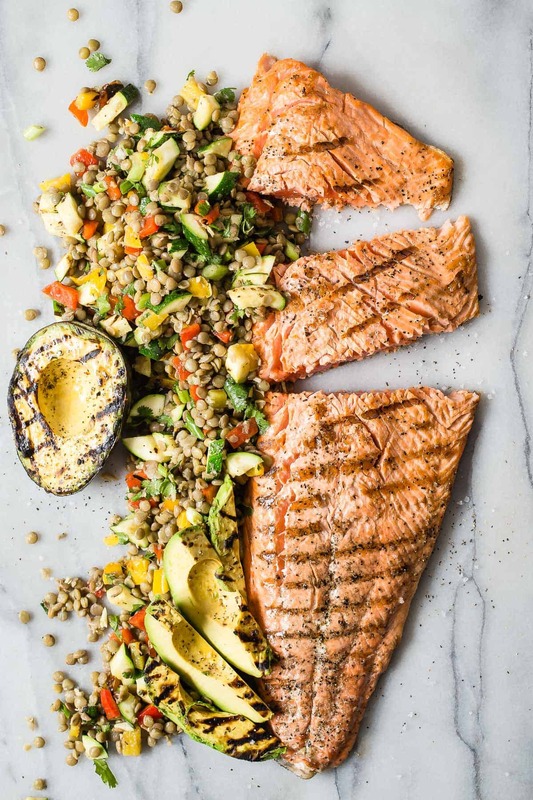 I like to cook the salmon as one whole piece rather than separate portions, It’s more like a sheet pan meal style and the salmon tends to stay moister. 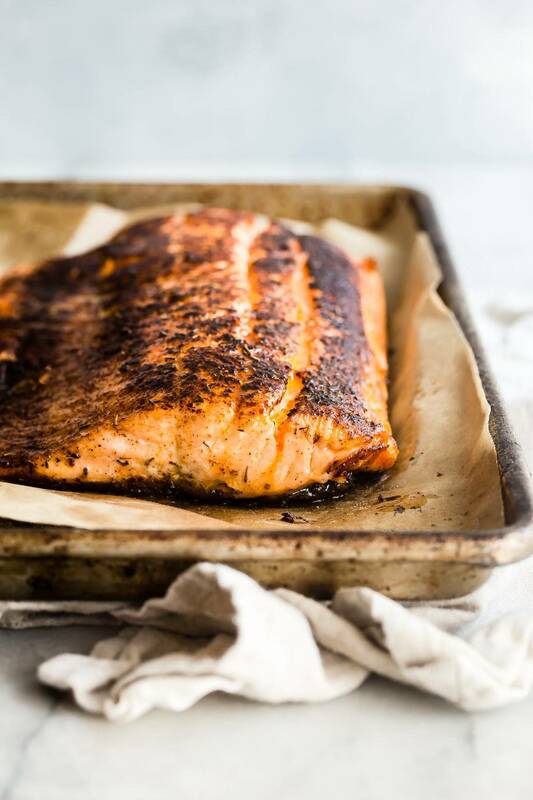 Salmon cooks quickly so don’t leave it for a long period of time. Yes, you can tell when it’s done by using a thermometer-ideal temp is 145 degrees- but not everyone has one, or one that works correctly so I always use the same method as I do when cooking steaks. I like to lightly press on the top of the salmon with my finger and it should feel firm but springy. If it doesn’t spring back it probably needs a little more time and if it feels like it’s hard to press down then it might be done too much. Another way to tell if the fish is cooked properly is to take a knife and carefully separate the salmon letting you actually see the inside. But then you’re salmon isn’t looking its best when you serve it. If you ever had elote or Mexican street corn, you’ll know how good it tastes. It’s creamy, a little spicy and covered in salty Cotija cheese. Usually, you eat it as ears of whole corn but for this recipe, it’s more of a salsa. Top the salmon with the corn and serve in slices. 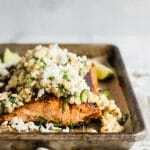 Check out these other salmon recipes and don’t forget to tag me on Instagram if you make any @foodnessgracious recipes! 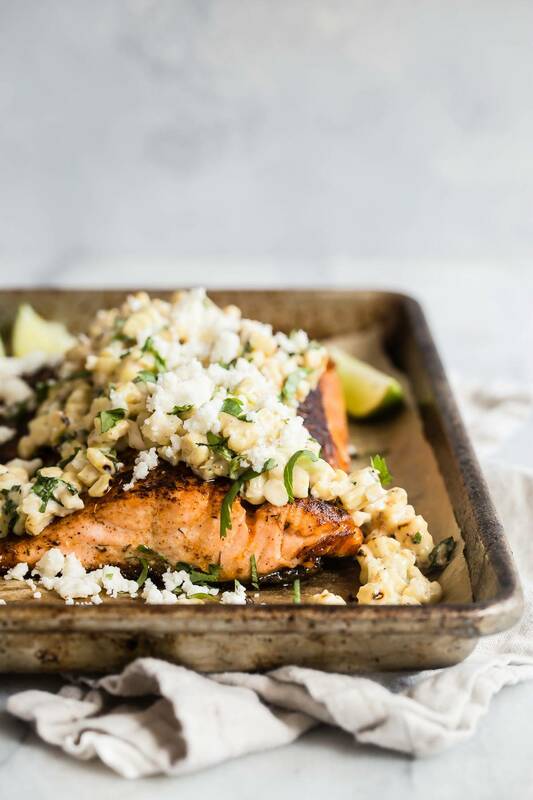 A delicious and juicy blackened salmon filet topped with creamy Mexican style street corn. This is an easy way to feed the family or a crowd of hungry friends! 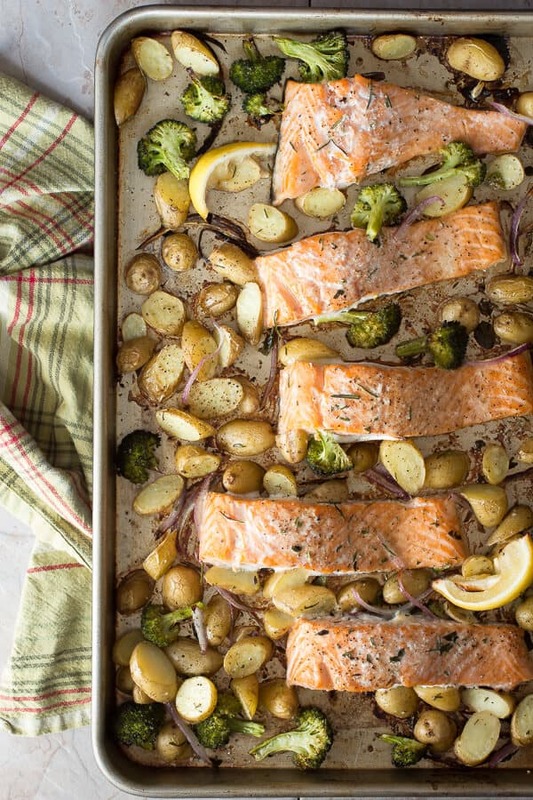 Line a baking sheet with foil and lay the salmon on top. Generously sprinkle the rub over the salmon and then drizzle the olive oil on top. Place the salmon into the oven and roast for 20-25 minutes or until it feels slightly firm when pressed on top with your finger. As the salmon is roasting, prepare the corn. Add the corn to a large nonstick pan and cook until no longer frozen. Drain off any excess water. Add the chipotle, cumin, salt, pepper, mayo and cream and stir over a low heat until well combined. Once the salmon is ready top the filet with the corn mixture. Add the crumbled cheese, green onions, and cilantro on top of the corn and serve into thick slices.